Turning London gardens into beautiful landscapes is what we enjoy at most. 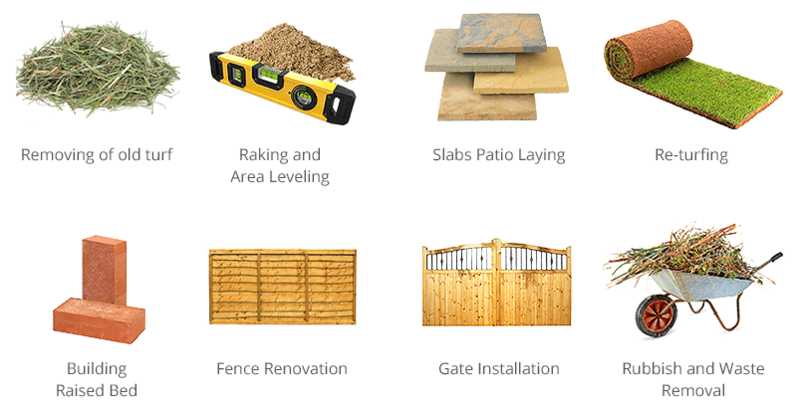 So we could not hide our excitement when a client from Old Ford, E3 contacted us with a request for a complete garden makeover including turfing, fencing, gate repair and creation of raised beds. The project was multicomponental and so we had to prepare for the appointed day with bringing variety of tools and materials in order to complete it fast, as the client had requested. For only 1 working day our professionals managed to do miracles with his place - they installed a completely new lawn on 15 square meters area, they laid a new patio area, they built a raised flower bed with bricks, replaced the old fence panels with new ones and installed a nice garden gate. Step 1. Free Viewing. 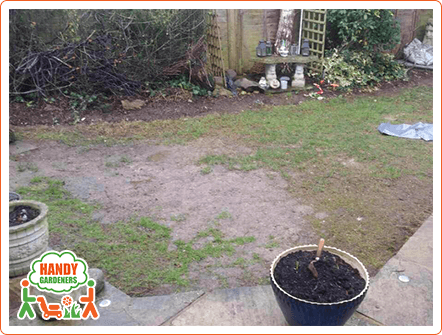 When the client contacted our team, he was particularly interested creating a new design for his garden in Old Ford, as it has not been touched for a few months and he was tired of looking at it in this bad state. We scheduled a free viewing and had our estimator visit the client in E3, London to discuss all the details and ideas for the eventual landscaping project. After all the materials and their brands were clarified, precise measurements were taken and the design of the project was mapped out and sent, the final price sounded very reasonable to our client and he booked us in right away. Step 2. Clearing the Area from Rubbish and Green Waste.. 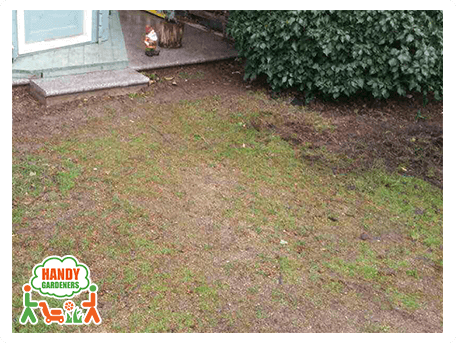 In the very beginning of this project in Old Ford, London, the landscapers started with preparing the terrain - clearance of any weeds, dead leaves and plants, removing the old turf done by digging it up followed by its removal. Step 3. Raking and Leveling the Area. 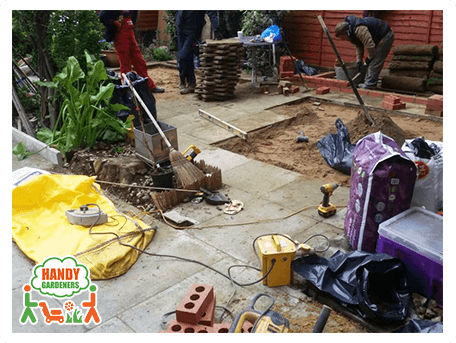 After all the rubbish and greenery was removed from the area in E3, London to be landscaped, the ground was leveled using specific tools and machines for this purpose. Raking the top soil into the surrounding soil is required to be done prior to starting any landscaping step, so all small areas such as depressions in lawn soil or bare spots could be leveled and the ground would be prepared for further work. Step 4. Patio Laying. The next step was to install a sand base for the new patio to be installed. The area that would be turned into a new patio was about 30 square metres. 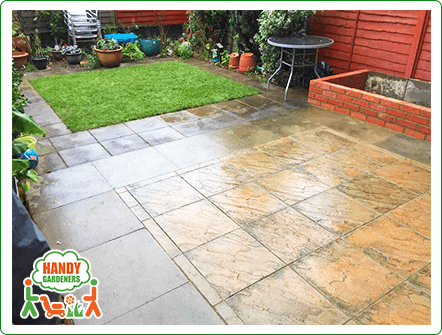 The client had purchased the materials for the patio, so we charged him only for the labour, as that is also an option for anyone who wants to personally choose the materials for the desired garden transformation. 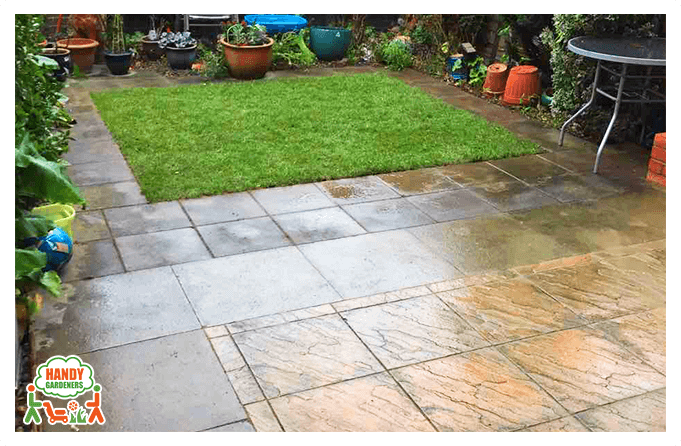 The client had selected slabs with two patterns, so the overall aesthetics of the garden in Old Ford, E3 would be greatly improved. 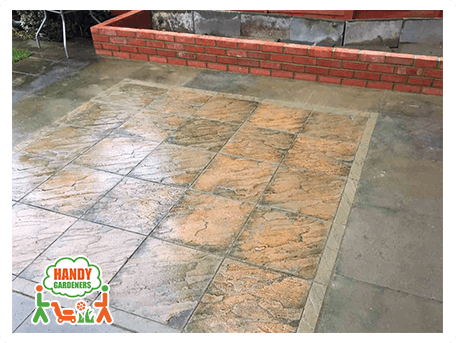 The slabs were attentively laid and the patio was finished using some concrete to fill in the gaps between its slabs for prevention of any weeds growing in them. Step 5. Raised Brick Bed Creation. The next thing our team did was to create a raised flower bed, so the owners of the garden could plant their beautiful flowers after we set the plants in it and lightly fill it in with soil. 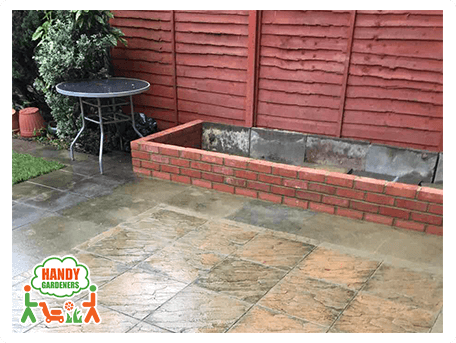 Our clients wanted a raised bed from bricks, so our team laid the bricks around it, assembled the corners and checked its level at the end to make sure it is all even. Step 6. Top Dressing. The next thing we had to proceed with in completing this landscaping project in Old Ford, London was to prepare the area to be turfed. After its leveling, it was necessary to add top soil on top of the leveled ground in order to improve the soil in the lawn. Good soil preparation is one of the most important steps when laying any type of turf. Step 7. Turfing. After the soil preparation was completed in a professional manner, it was time to lay the new natural turf. The grass was carefully aligned to each corner to square turf, as it formed a beautiful green lawn. Very important detail in turf laying is that it is being installed as soon as possible on the day the turf is delivered, as we did it on the very same day. The finishing touches of the turfing were to soak it well after laying and put top dress turf in needed. Step 8. Fence Renovation. The fence required some work, as it had been old and neglected. 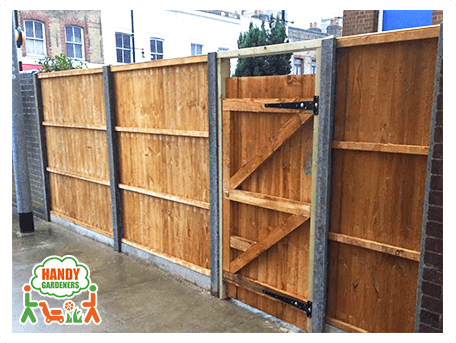 Its renovation consisted of replacing three of the old fence panels with three brand new gravel boards and five concrete posts. The fence replacement added up to the new and fresh look of the landscaped garden in E3, London. Step 9. Gate Installation. The final step of this landscaping project in Old Ford, London was the installation of the garden gate. The important part of this step was the gate to be in the same colour as the new fence, so we made sure of it. In the end everything looked perfect, like a dream come true. The client was super happy with the result and she was grateful for all the hard work and professional attitude of our landscapers during the job.